We left Cave City and headed north about 60 miles to Fort Knox Kentucky. Camp Carlson Army Recreation Area which has a beautiful campground was our home for 4 nights. 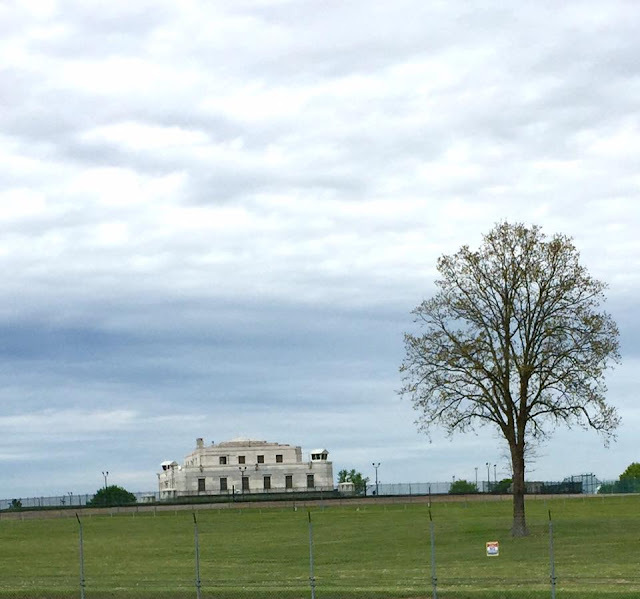 The Army Base at Fort Knox is adjacent to the United States Bullion Depository. That impressive fortress is surrounded by tall fences and guards. It looks more like a prison than a bank. The Gold Vault is located on the road that leads to the main gate at Fort Knox. On base you drive streets called Gold Vault Road and Bullion Blvd. I was hoping for a closer look at the Depository building but the security is pretty extreme. We learned that not only are there no tours, you can only visit the Depository with an order signed by the President of the United States. Later that day we had a chuckle as we drove though the town of Radcliff near by and saw a half dozen pawn shops with signs like these. When we had dinner with Joe and Brenda a few nights before they recommended the Whistlestop Cafe as good place to go for a meal. 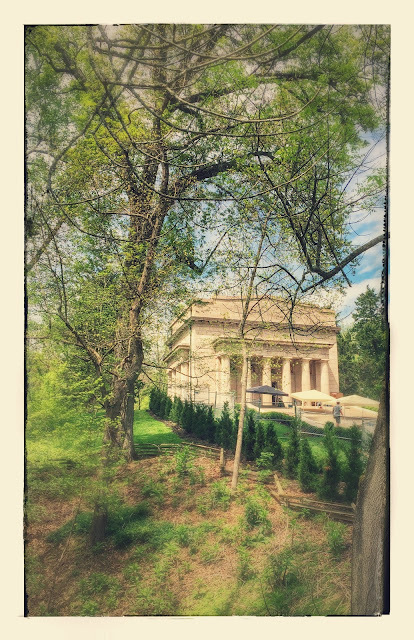 We decided to combine that visit with seeing another National park and headed out to The Abraham Lincoln Birthplace in Hodgenville. This small and impressive National Park is located in a rural area that makes it easy to imagine life as it might have been for the Lincoln family on what was then a frontier. The Memorial is built on high ground uphill from Sinking Spring which provided drinking water for the family. Sinking Spring is still flowing. We enjoyed walking down the stone steps into the cool cavelike area and seeing another example of Kentucky's famous Karst topography. They call this the First Lincoln Memorial. It was completed in 1911 to house a reconstruction of the birth cabin of our 16th president. The memorial designed by John Russell Pope and built by the Lincoln Farm Association was funded by a public campaign that raised $350,000 from the American Public. That was an impressive amount of money in the early 1900's. Over 100,000 Americans contributed to the building fund. We enjoyed a stop at the visitor center before walking a trail to the top of the hill to see the log cabin inside its climate controlled marble and granite enclosure. The 56 steps that lead to the memorial are being repaired this year. We were happy to see the work being done, to preserve our National Park but it was disappointing not to be able to approach the memorial by walking up the steps. Part of the log cabin inside the memorial. Hungry after our tour we headed down the road to Glendale and lunch at The Whistlestop. This family style restaurant is located on Main Street right next to the Railroad tracks. It was established in the 1970's as a sandwich counter in the Hardware store and was so successful that by 1979 the family sold off the Hardware stock and used the entire building as a restaurant. Southern cooking with home recipes made from scratch have made it a local favorite. When you go try the fried chicken and lemon meringue pie. You won't be sorry. Fort Knox is not far from the Jim Beam Stillhouse in Clermont. We spent the next afternoon at the distillery sampling and learning about the process of making bourbon. The people that work here are so happy and enthusiastic about their product. They obviously enjoy their work but maybe, just maybe it has something to do with all the evaporation of alcohol and that Angels Share they keep talking about. Just breathing the air in the Stillhouse makes you happy. Sampling Knob Cteek straight from the barrel. We had a glimpse of the process from corn and sourmash to the opening of a barrel of Knob Creek that was designated single barrel status. We observed and participated in the bottling process, marking and washing our bottles (with bourbon) and watching them through the line, then sealing them with our thumbprints in the wax. Fred holding the bottles of Knob Creek that we processed. Bourbon Dispenser in the tasting room. The tour ended with a unique sampling experience. In the tasting room each person in the group was issued a card giving credits for samples. The Bourbons were all in dispensing machines like the one above. To receive a sample you have to insert your card into the machine, hold your glass under the spigot and push the button of your choice. My card and glass were empty much too soon.